In my post about CSAIL Holiday Baking Fest, I neglected to provide any nutrition estimates for the pies I made. Since I’m about to start making more pies for Christmas, I was reminded that I had left this undone. 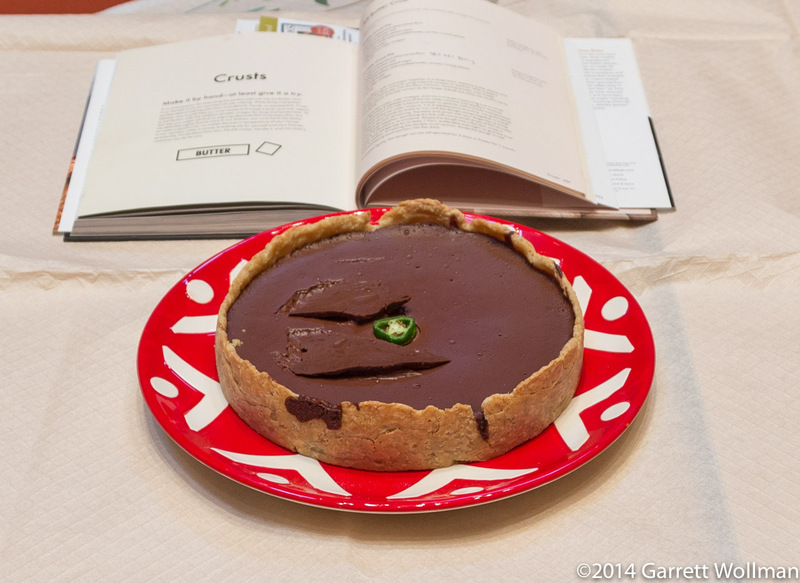 I gave nutrition data last year for Cook’s Illustrated ‘s Chocolate Caramel Walnut Tart, so I’m not going to repeat that one. I believe my data from last year were based a higher-cacao chocolate than I used this year, but the biggest difference from the numbers shown in my previous post is always going to be exactly how much of the dough makes it into the finished tart crust. For the Green Chil[e] Chocolate Pie, I used the regular “all-butter” pâte brisée rather than the chocolate version actually called for in the recipe. Several of the pies from Joanne Chang’s Flour cookbook call for a pâte sucrée crust. Pâte sucrée is more like a cookie dough in construction than a traditional pie crust — in fact, it’s made by the creaming method, like most cookies, and gets most of its liquid from egg yolks rather than water or juice as in pâte brisée. Chang’s dough is quite stiff and requires a good bit of effort to roll out; when using it as a tart dough, I generally follow the construction technique from Cook’s Illustrated , which involves freezing the flat sheet of dough and then using the tart pan itself to cut the dough to size. When applied to a 10-inch tart pan, Chang’s dough must be rolled out quite thin, and does not need to be weighted during blind baking. This recipe is from Emily and Melissa Elsen, Four & Twenty Blackbirds Pie Book , p. 204. I’d call it a tart, since it stands on its own when removed from the baking dish, although it’s actually made in a nine-inch springform pan rather than a tart pan. And it’s made with green chiles (jalapeños) and ginger, not green chili (a stew made with chiles, onions, and cumin). But it was delicious regardless of what you call it, and I ended up making photocopies of the recipe for a couple of coworkers who particularly appreciate spicy things. I used Callebaut 811NV for the chocolate, as previously described, Country Hen eggs, and Sky Top Farms unhomogenized cream. For ease of comparison, I show eight servings per pie below, but at Holiday Baking Fest we cut it into sixteen slices, and for normal home baking I’d make ten or twelve. You know the drill. 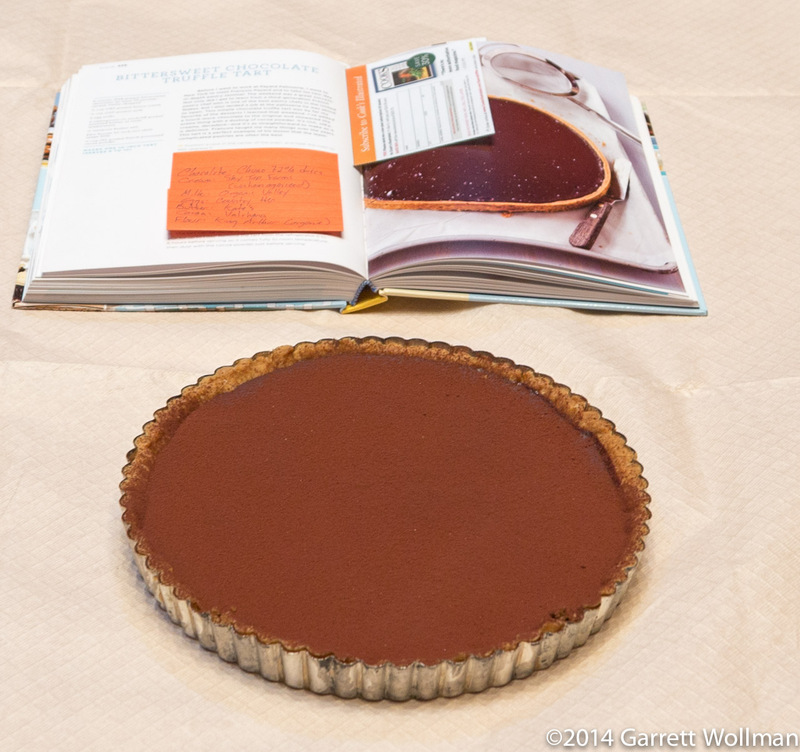 The photo in the cookbook ( Flour , p. 226, photo on p. 227) shows a straight-sided tart which looks a lot like the Four & Twenty Blackbirds pie-in-a-springform-pan. I used a normal (fluted) tart pan, but it was still a favorite of those who had a chance to try it, and it was definitely my personal favorite of the things that I brought to Holiday Baking Fest. I used Chuao’s 72% “tasting discs” to make this recipe, but the nutrition data below are computed using the more easily available Valrhona Guanaja (and Valrhona cocoa powder on top); the recipe specifies “at least 70%” chocolate. This entry was posted in Food and tagged chocolate, chocolate pie, Four & Twenty Blackbirds, Holiday Baking Fest, Joanne Chang, recipe. Bookmark the permalink.